I am always looking for resources to help supplement or even enrich our homeschool curriculum. So many times, though, I get overwhelmed just trying to figure out where to begin looking. I've now found that starting point! We've started using the resources available through the CHSH Download Club from CHSH-Teach.com. 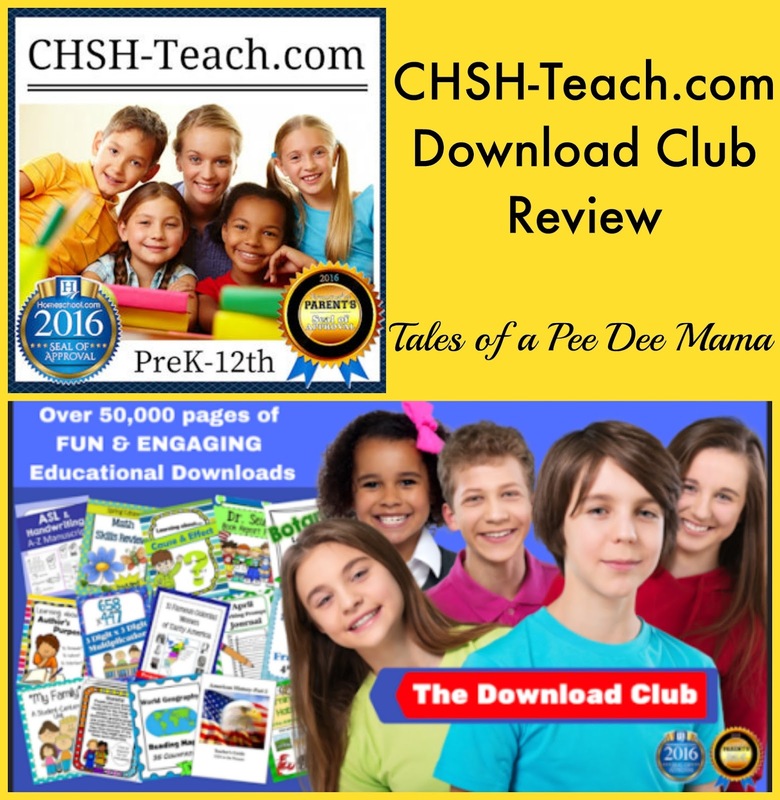 For this review, we received an annual subscription to the CHSH Download Club, which is an online site full of incredible downloadable resources. It's hard to know where to even begin in describing what the CHSH Download Club offers. Like the graphic above shares, there are over 50,000 pages of educational material available. I guess I'll just start by sharing how they have everything organized. The menu page is organized into several different categories, making it even easier to find exactly what will best suit your needs. The first category is By Subject - Bible, Foreign Language, Arts & Crafts, Language Arts, Math, Science, Social Studies, Electives, and Health. Another category is By Grade - Preschool/Kindergarten, 1st-3rd grades, 4th-8th grades, and high school. In addition to being able to search for resources by subject or by grade, they also offer resources By Month. This is great if you want to create a themed unit for a specific month, season, or holiday. For example, for September/October, there are resources for 9-11, Fall, Johnny Appleseed, Columbus Day, Hispanic Heritage Month, and Pumpkins. CHSH Download Club also has organization resources, like planning and record keeping forms, graphic organizers, and flashcards. This year, I wanted to put together my own resources for The Boy's English III credit. We've used packaged curriculum for his English I and II, which worked for us those years, but due to some changes in circumstances, I couldn't find what I wanted in a packaged curriculum. CHSH Download Club to the rescue! I found a 54 page downloadable English III Teacher's Guide that provided a lot of structure for me to decide what needed to be included for him this year, including tips for having him write a research paper, several activities to be used to respond to the literature he reads this year, and writing prompts for essays. One of the other resources that I absolutely love is the downloadable graphic organizers. There are over 80 different organizers included in the download, which provide a variety of choices such as Venn Diagrams, flow charts, and word webs. I love having my kids use graphic organizers to help them with taking notes on information they read in science and history; finding the main characters, setting, etc., when they are reading literature; and brainstorming for writing assignments among other things. These are just a few of the thousands of resources available at CHSH-Teach.com through the CHSH Download Club. I'm sure whatever you might need to help supplement or enrich what you're teaching, you'll be able to find it. Are you interested in what others have to say about the CHSH Download Club? Check out more reviews from the Schoolhouse Review Crew.